In an alternate present day, humans, orcs, elves and fairies have been coexisting. Two police officers, one a human, the other an orc, embark on a routine night patrol that will alter the future of their world as they know it. Director and producer David Ayer offers a part buddy film, reminiscent of the likes of Training Day, Alien Nation with a bit of Tolkien thrown in and you get what adds up to an enjoyable entertaining well paced movie. With wall to wall shoot outs, slick fights and magic wand sorcery Ayer handles the diverse mix of genre themes effortlessly as the unlikely paired partners battle rentlessly throughout an evening in L.A. Actors Will Smith is on nonchalant form as Serpico-like Daryl Ward, unrecognisable Joel Edgerton with Orc makeup sporting a Nic Nolte-like raspy voice gives a standout performance as Nick Jakoby. Noomi Rapace is notable as a power hunger Elf and gives a physical intense turn as she goes about retrieving her wand to unleash a dark Lord. However, Lucy Fry steals the show as Tikka, a Rogue Elf who assists the unlike Orc and human police channeling Milla Jovovich’s Fifth Element Leeloo. Writer Max Landis (son of John Landis) and Ayer throw in hints of comedy, a clever alternative Earth premise and interestingly set it during a night and day in L.A. 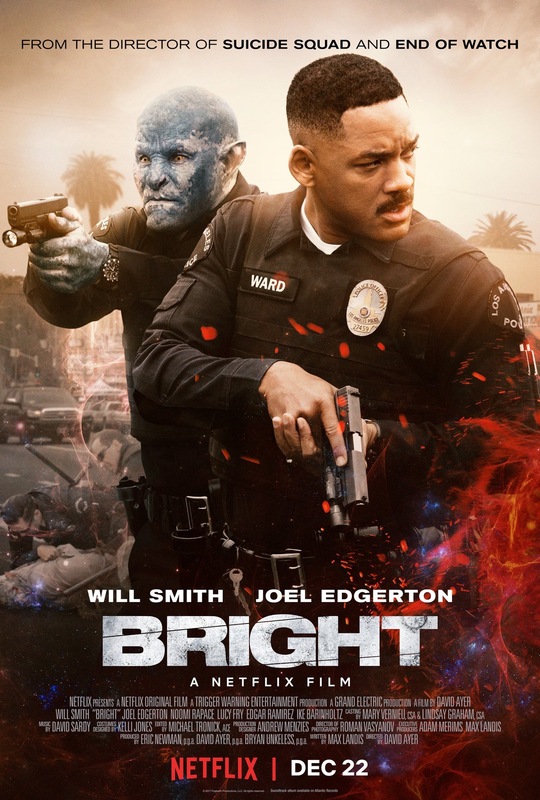 Bright has plenty of ‘street’ atmosphere, as well as strong production values offering well executed special effects. To Ayers credit the mix of both reality and fantasy hold together seamlessly and you buy into the world and the Midnight Run, Judgement Night, Collateral, After Hours feel to name a few night set films from the get go. Overall, a well balanced mix of genres in an alternative present day, with both underlying and on the nose social commentary that is almost too good for an action fantasy cop film. Recommend.